The biggest leak of confidential documents in the history of the Middle East conflict began on Sunday, 23th January 2011 by the Al-Jazeera website with Britain’s Guardian newspaper. A cache of thousands of pages of confidential Palestinian records covering more than a decade of negotiations with Israel and the US has been obtained by al-Jazeera TV and shared exclusively with the Guardian. The papers provide an extraordinary and vivid insight into the disintegration of the 20-year peace process, which is now regarded as all but dead. The Palestinian Papers (“PaliLeaks”) show that Israel indeed had real partner with whom to negotiate issues such as borders, land swaps, settlements, refugees, Jerusalem and even recognition Israel as Jewish state. The authenticity is accepted by both sides. While the greater Middle-East is now in turmoil due the coup in Tunisia, PaliLeaks are causing shockwawes among Palestinians and in the wider Arab world. The papers are giving also perspective to possibilities for two-state solution and US facilitation, mediation, to reach it. The Palestine Papers, released in the Al-Jazeera website, cover the negotiating period from 1999, before the Oslo process broke down in Camp David, up to the frozen peace talks in 2010. Al-Jazeera is publishing 275 sets of meeting minutes, 690 internal e-mails, 153 reports and studies, 134 sets of talking points and prep notes for meetings, 64 draft agreements, 54 maps, charts and graphs, and 51 “non-papers” – alltogether at least 1,684 documents. The documents revealed by Al Jazeera seems to be much more important than the documents recently released by WikiLeaks. The scale of confidential concessions offered by Palestinian negotiators, including on the highly sensitive issue of the right of return of Palestinian refugees. The Palestinian Authoroty agreed first that solely10,000 and finally 5,000 Palestinian refugees return to Israel as part of the Palestinian right of return. Among other documents due to be released is an Israeli offer to transfer Israeli Arabs citizens to the territory of a future Palestinian state. The intimate level of covert co-operation between Israeli security forces and the Palestinian Authority. The central role of British intelligence in drawing up a secret plan to crush Hamas in the Palestinian territories. How Palestinian Authority (PA) leaders were privately tipped off about Israel’s 2008-9 war in Gaza. When Palestine people gave a winning support to Hamas in relatively democrat elections many EU and US leaders made conclusion that voters made a wrong selection. To spread western values and real democracy some actions were taken. British intelligence – MI6 – had remarkable role in fight against Hamas. The bulk of the British plan has since been carried out by the West Bank-based PA security apparatus which is increasingly criticised for authoritarian rule and human rights abuses, including detention without trial and torture. The documents also highlight the intimate level of military and security cooperation between Palestinian and Israeli forces. Moreover, Al-Jazeera revealed that Palestinian President Mahmoud Abbas was personally notified by a senior Israeli official that Israel was planning an attack on the Gaza Strip, the night before Operation Cast Lead. Israeli and Palestinian officials reportedly discussed targeted assassinations of Hamas and Islamic Jihad activists in Gaza. Many of the concessions have been considered non-negotiable in the past such as the right of Palestinian refugees to return to Israel. Palestine refugees are the people and their descendants, predominantly Palestinian Arabic-speakers, who fled or were expelled from their homes during and after the 1948 Palestine War, (some 750,000) and after the Six-Day War (1967) (280,000 to 325,000). UNRWA’s definition of a Palestinian refugee also covers the descendants of persons who became refugees in 1948. The number of Palestine refugees varies depending on the source. For 1948-49 refugees, for example, the Israeli government suggests a number as low as 520,000 as opposed to 850,000 by their Palestinian counterparts. As of January 2010, UNRWA cites 1,396,368 registered refugees in camps and 3,370,302 registered refugees not in camps. Former prime minister Ehud Olmert had agreed (2008) to a proposal that would have seen 1,000 Palestinian refugees given the approval to return to Israel over a space of five years. This would have resulted in a total of 5,000 refugees whose entrance into Israel would have been based on certain criteria and humanitarian grounds. By the following year (2009), PA main negotiator Saeb Erekat appeared to have accepted that choice. Condoleezza Rice, the Bush administration’s secretary of state, wanted to settle displaced Palestinians in Argentina and Chile as an alternative to letting them return to former homes in Israel and the occupied territories. Rice made the proposal in a June 2008 meeting with US, Israeli and Palestinian negotiators in Berlin. Ms Livni, meanwhile, repeatedly suggested a land swap with the Palestinians, so several Jewish settlements in the West Bank would become part of Israel while Israeli Arab were moved out of Israel. Correspondents say while this move would have been on a limited scale, it is the first time Israel has apparently suggested moving populations to either side of future borders, rather than just swapping land. On 2004 there was a similar idea that Israel compensate the Palestinians with land occupied by Israeli Arabs. The Lieberman Plan, also known in Israel as the “Populated-Area Exchange Plan”, was proposed by Avigdor Lieberman, the leader of the Israeli political party Yisrael Beiteinu. The Lieberman Plan only advocates ceding the Triangle Arab communities, the ethnic Druze community, which is pro-Israel, would also remain part of Israel. “Israeli Arabs will not lose anything by joining the Palestinian state. Instead of giving the Palestinians empty land in the Negev, we are offering them land full of residents, who will not have to leave their homes,” said Deputy Foreign Minister Daniel Ayalon in an interview to London-based al-Sharq al-Awsat newspaper published in early February 2010. The settlements are a known issue of contention between Israel and the United States; although America has not supported their construction, it has, on some occasions, recognized the realities that have developed over 40 years. Improbability for two-state approach is big without massive withdrawals from Israeli settlements in the West Bank and East Jerusalem, where over 500,000 settlers now live. PaliLeaks are showing serious attemp to find a compromise between total withdrawal to the 1967 border and a redefined border through land swaps. 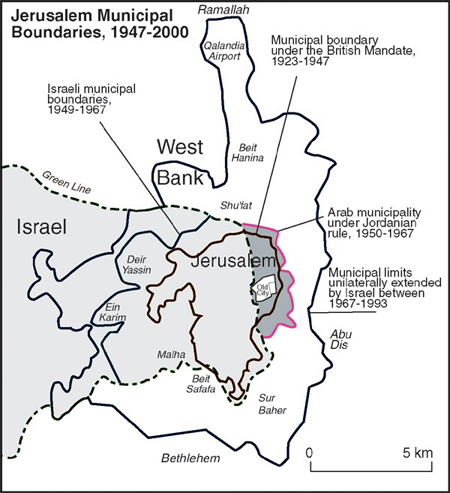 Latest proposal on 2009 included Israeli annexation of two percent of the West Bank and East Jerusalem adjacent to the 1967 line containing about 350,000 setters in big bloc settlements. In return, Israel would evacuate about 150,000 other settlers and transfer to Palestine two percent of its land, of equal quality, next to the southern West Bank and Gaza. Israel’s current leadership (which is dominated by the settler, religious and ideological right) as well as extreme Hamas elements would probably resist this, however leaked documents show that with current PA an agrement might be possible. As well as the annexation of all East Jerusalem settlements except Har Homa, the Palestine papers show PLO leaders privately suggested swapping part of the flashpoint East Jerusalem Arab neighbourhood of Sheikh Jarrah for land elsewhere. Erekat told Israeli leaders in 2008: “This is the first time in Palestinian-Israeli history in which such a suggestion is officially made.” No such concession had been made at Camp David. But the offer was rejected out of hand by Israel because it did not include a big settlement near the city Ma’ale Adumim as well as Har Homa and several others deeper in the West Bank, including Ariel. 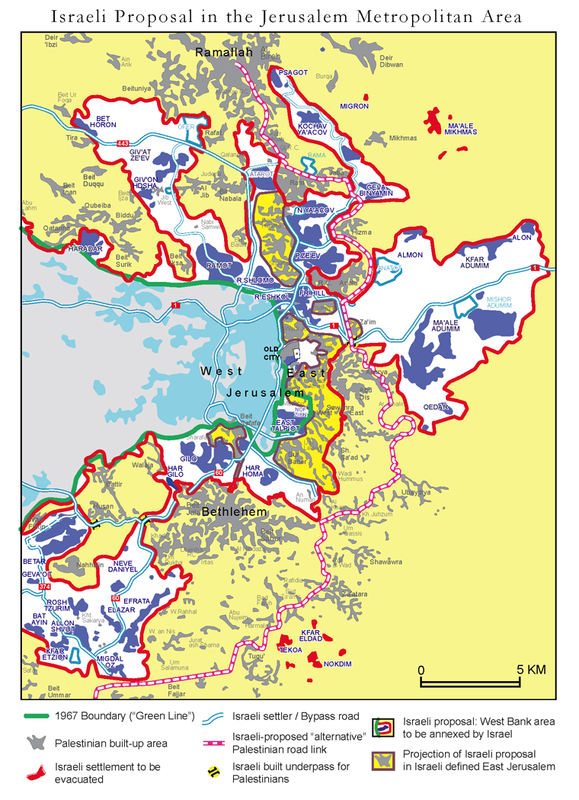 the major territorial disputes remain over Ariel, Elkana, Ma’aleh Adumim and the Har Homa suburb of East Jerusalem (which was built after the 1993 Oslo Accords). Speaking about borders one should note that Israel, in pre-1967 borders covers approximately 19% of British Mandate Palestine (of which 9% is the Negev dessert). The West Bank and Gaza cover approximately 7%, and Jordan covers approximately 74%. 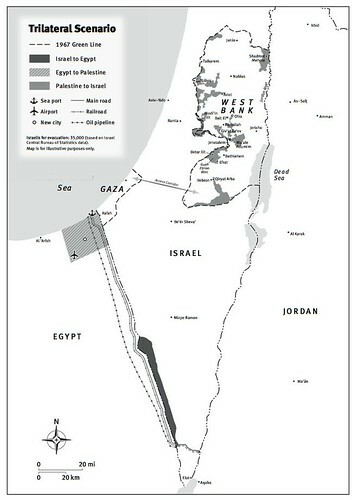 By coincidence same day when Al-Jazeera started to publish PaliLeaks, the New York Times published a map of a land-swap proposal prepared by David Makovsky of Washington Institute for Near East Policy , which indicates territory inside the Green Line that Israel would give to the Palestinians in return for the settlement blocs. Makovsky’s D.C. office is located near that of Dennis Ross, who serves as a senior adviser to the Obama administration in the peace process. Now a Washington think tank with close connections to officials in both Israel and the United States has sketched out realistic borders for a new Palestinian state. The Washington Institute for Near East Policy/David Makovsky Strategic report Imagining the Border Options for Resolving the Israeli-Palestinian Territorial Issue includes a series of maps showing detailed options for removing most of the West Bank from Israeli occupation. According publisher in this new Washington Institute report, David Makovsky analyzes the intersection of demography and geography in the West Bank in order to demystify the territorial dimension of the conflict and facilitate peacemaking. Through detailed maps and in-depth population data, he shows how the parties can use land swaps to meet some of their most important goals, such as minimizing dislocation, ensuring security, and establishing a contiguous Palestinian state in the West Bank. The Palestinians have been rejecting compromise deals that would have given them an independent Palestinian state (the first ever in history) for more than 60 years. They rejected United Nations resolution 181 in 1947 dividing the land west of the Jordan river into two states, Jewish and Arab. Palestinian leader, Yasser Arafat, rejected the Clinton proposals in 2000 at Camp David, and then walked away from the Taba negations in 2001 which would have given him virtually everything he had been demanding. In November 2007, Israel, the Palestinian Authority and the Bush administration convened in Annapolis with the unified goal of solving all outstanding issues. Annapolis provided the framework for direct negotiations between Israel and the Palestinians toward bringing an end to the conflict and to all claims. Most recently, in the 2008 post-Annapolis negotiations, the Palestinians and Israelis almost finalized an agreement negotiated by the two sides. It was to include a Palestinian state on the about 95% of the West Bank, the Gaza Strip and Arab East Jerusalem, with a land bridge connecting Gaza and the WB. 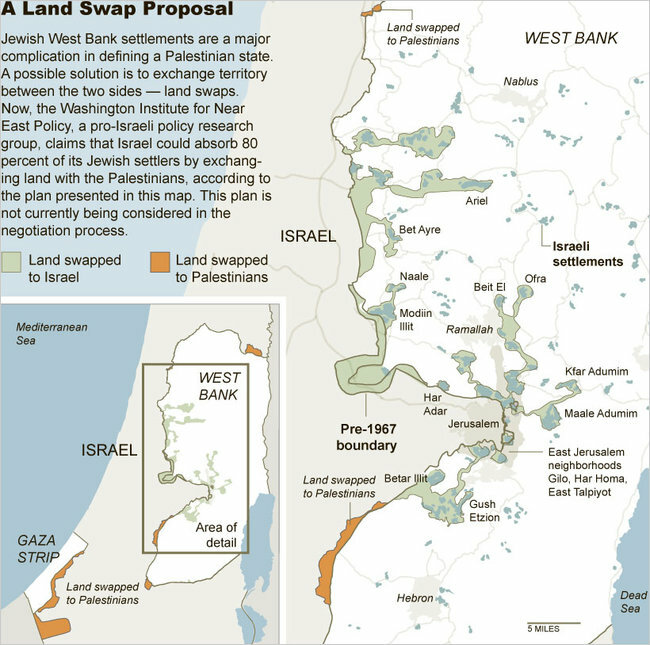 There was to be a land swap between Israel proper and the remaining 5% of the WB along the proposed future border where most of the Jewish settlers live. Israel was also to pay compensation to the descendents of Palestinian refugees. rather than establishing another Arab state, the parties could return control over most of the West Bank to Jordan. Until recently, such an idea was rejected completely by everyone, especially the Jordanians themselves. Today, however, more and more Jordanians, Palestinians, and Israelis have come to believe that this is the right solution. If a Palestinian state is established there (WB), many fear that it would be taken over by Hamas. Such a scenario could have far-reaching consequences for Jordan. To be sure, the notion of pursuing alternative solutions is not yet politically correct, and therefore no official Jordanian or Palestinian support could be given to such efforts at the moment. Nevertheless, tacit support for this idea has been expressed in private talks. For their part, many moderate West Bank Palestinians believe that an independent Palestinian entity in the West Bank and Gaza would not be a viable state. Sooner or later, this unstable situation would facilitate a Hamas takeover, and moderate Palestinians would prefer to live under a Jordanian regime rather than Hamas. It is important to note that most Palestinians never strove for an independent Gaza–West Bank state in the first place. They want to be free of Israeli occupation and pursue a normal life, but they do not much care about the exact form of the political solution. I have made same conclusions and propagated long – instead of dead road maps towards two-state – for “three-state” approach”, where Gaza is returned to Egyptian control and the West Bank in some configuration reverts to Jordanian sovereignty. From my point of view this solution could be from administrative point of view stronger as well economically more sustainable. (More e.g. in “The Three-State Option could solve Gaza Conflict” ). The three-state solution essentially replicates the situation that existed between the 1949 Armistice Agreements and the 1967 Six-Day War. Beginning in 1949, Egypt occupied the Gaza Strip, Jordan occupied the West Bank and East Jerusalem, and no Palestinian Arab state existed. In 1950, Jordan officially annexed the West Bank and granted the Arab residents Jordanian citizenship. One may note that between 1949 and 1967 neither of those countries, nor any other voice in the Arab world or among the Palestinians, believed it was right to establish a Palestinian state in those territories, even as a temporary solution until the land was liberated in its entirety. Why the PaliLeaks took place in overall, why they happened now and by whom? These questions are essential while thinking forward now stagnated Israeli-Palestinian peace process. The identity of the source for the Palestine papers is not proofed. However among PA there is strong suspicion that a former CIA agent (Clayton Swisher) and a former EU official (Clayton Swisher) were responsible for leaking the Palestine Papers. Also former Fatah security commander Muhammad Dahlan, who has been accused of planning to overthrow the PA leadership, is believed to help to lrak the documents to embarrass and discredit Abbas and his top negotiators. Related to timing some observers think that the revelation of Palestinian negotiators’ willingness to compromise would not just offend Palestinian pride but instantly spark a wave of revulsion, leading to a Tunisia-style revolt against the PA. Also Hamas accused the negotiators of betraying the Palestinians. From the other side one can also claim that PaliLeaks are preparing Palestinian public opinion for the painful concessions that peace will, one distant day, require. The first reaction among The Palestinian Authority was that the documents are “a pack of lies”, PA was accusing al-Jazeera of distorting the truth and quoting statements out of context. However after few days, when there were serious evidence that documents are based to facts, the PA (Erekat) said that “ the lesson that should be drawn from the documents is that the Palestinians are serious about peace”. Indeed, from Israeli perspective the Palestine papers are helping Israel to understand that there is a partner on the Palestinian side. The details indicate that Annapolis was the most serious attempt so far at reaching an Israeli-Palestinian deal. The Bush team facilitated the removal of 25 Israeli settlements from Gaza and the West Bank in 2005, and pushed for a final-status deal in Annapolis as well post-Annapolis talks. The new round facilitated by Obama team has stagnated, hard line government in Israel is not so eager for compromises and Hamas still has remarkable support among Palestinians being as well the real authority in Gaza strip. It is claimed that the documents could well destroy the Palestine Liberation Organization, a coalition of parties that includes Fatah, which is led by Palestine Authority President Mahmoud Abbas. Can Fatah survive being discredited to this extent, the time will tell. However the papers, especially the leaked maps, will serve as the starting point for future negotiations. How the peace process will continue is depending first if/how political leadership of Israel and PA is transforming, second ongoing events in Egypt and Lebanon may have their influence, third indirect Israel-Syria peace talks (“giving up the Golan”) may help peace in north. The most important outside factor may be if there is any progress with negotiations about Iran’s nuclear program. From my point of view the bottom line is that based on PaliLeaks the peace agreement was more near than ever since 1967 at least with PA. Also two-state solution was and maybe still is realistic – although without Gaza. Despite this in my opinion creating a new Palestinian state in fragmented West Bank is not a viable – or even desired – solution, not economically nor from administrative point of view. A Jordanian option for WB would be more sustainable and three-state solution for WB, Gaza, region and its population. This entry was posted on Saturday, January 29th, 2011 at 2:12 pm and is filed under BalkanBlog, crisis management. You can follow any responses to this entry through the RSS 2.0 feed. Both comments and pings are currently closed. ReallyGood blog,Thank you verymuch for you time in writing the posts…. Are we to assume then that this exchange will not include the vast issue of the Jewish refugees from Arab countries? It’s difficult to believe that a Palestinian Arab wouldn’t prefer a possible 10 hectares of land in Morocco to one acre of scrub land on the West Bank.